Trump is attacking a steelworkers union leader for calling out Trump’s lies. Donald Trump, America’s troll in chief, picks Twitter fights with anyone who calls him out. So it should come as no surprise that the president-elect is going after Chuck Jones. Jones is the president of United Steelworkers Local 1999, which represents Carrier workers in Indiana, and he just called out Trump’s troublesome relationship with the truth. Big time. The union president’s language was blunt—as the language of working Americans and their champions often is. But his point was well taken. For all of Trump’s efforts to pat himself on the back, he did a lousy job of negotiating with United Technologies, the company that owns Carrier. Most of the United Technologies/Carrier jobs in Indiana that were threatened with offshoring will still be lost under Trump’s deal. United Technologies still plans to close a major plant in the state. And the plant Trump said he helped to “save” will have dramatically reduced employment. Trump’s double-talk was too much for Jones, who decided to set the record straight. After the president-elect claimed to have “kept” 1,100 jobs at the Indianapolis Carrier plant, Jones reported that Carrier was telling him only about 730 production jobs at the Indianapolis facility would be saved. Trump inflated his “kept” jobs claim by counting roughly 350 research-and-development positions that the company had no plans to move to Mexico. That made it look like he had convinced United Technologies to save the vast majority of the Indianapolis jobs that were slated to be shifted to Mexico—when in fact hundreds of positions are being lost at the factory in that city. And Trump made no mention of the 700 jobs that will be lost when the United Technologies plant in Huntington, Indiana, is shuttered. That kind of talk did not go over well with America’s fragile president-elect. On the same day that Time announced the selection of Trump as its “Person of the Year,” the billionaire took time out from picking a cabinet to pick on the leader of a union local in Indiana. That’s an absurd statement that shows how dramatically disconnected Trump is from realities on the ground in embattled manufacturing towns across the United States. Jones is not the one sending jobs to Mexico. The steelworkers union is not putting profits ahead of American workers and American communities. United Technologies is doing that. Jones and his union local have fought for threatened workers in Indianapolis and other Indiana communities. It’s not unreasonable to suggest that one of the reasons Trump renewed his interest in the Carrier cause was because Local 1999 and its allies kept making noise. 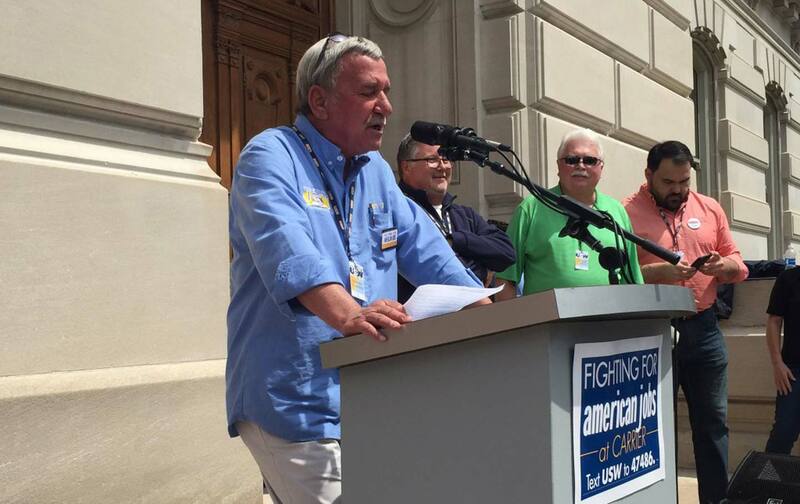 And Chuck Jones is still fighting for the workers of Indiana—to the great dismay of Donald Trump. Given the choice between Donald Trump and USW Local 1999 President Chuck Jones, working people have every reason to take the side of the union president who makes the president-elect so angry. Jones, not Trump, is the president who takes seriously the task of keeping jobs in the United States.